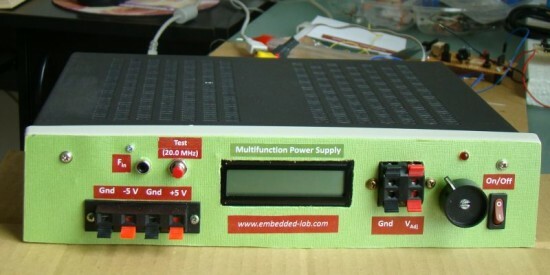 Here's a great writeup on a lab power supply with fixed positive and negative 5 volt outputs and an adjustable output. A nice feature of this setup is the use of a PIC-based circuit to read supply voltage and current. "One important parameter in embedded system designing is power consumption. This parameter is directly related to the battery lifetime, if the system is to be powered from a battery. In order to determine the power rating of your designed system, you need to know how much current the system draws from the source at a given voltage. While working on my projects, I usually measure current by placing an external ammeter in series with the current’s return path. This is not always convenient to do, and so I thought of making a special power supply unit for my lab that would display both voltage and current information on a LCD screen while prototyping my circuit. This way I can continuously monitor how much power my test circuit is drawing at a specific operating voltage. This power supply unit provides fixed ±5 V as well as a variable dc voltage ranging from 1.25 V to 9 V. A PIC16F689 microcontroller is embedded into the power supply unit to measure the adjustable output voltage along with the load current. Besides, this unit also has a built-in frequency counter to measure the frequency of an external signal. The range is over 50 MHz. However, it has been tested up to 20.0 MHz, and works fine. There are still few I/O ports of PIC16F689 that are not used. So I am thinking about adding one or more features (like capacitance meter) to it. But that would be on my second version..."
In this age of more and more "things" connected to internet, security becomes a big issue. It's one thing to have your internet-connected toaster hacked and you have burned toast for breakfast but quite another to have a internet-controlled traffic signal hacked to turn the light green in all directions! Ron Wilson has some thought-provoking comments based on real-world events. "In marketing speak, it is the Internet of Things. Just as in the first decade of this century the Internet connected the world’s people, so—the pundits tell us—in this decade, the Internet will connect the world’s man-made objects. The toaster will talk to the television, and the light switch will lie down with the lamp. Without debating the wisdom of this scenario for global unification, we feel the need to offer it a hurled monkey wrench and then to observe the consequences. Our spanner comes in the form of that recently famous computer virus, Stuxnet. As you may recall, no one has admitted to being the source of the virus. But it appears that some organization opposed to Iran’s nuclear program launched Stuxnet onto the Internet to attack the software that controls Iran’s uranium-enrichment centrifuges. Unfortunately, Stuxnet seems to have attacked many other instances of this widely used software, as well, making it perhaps the first act of global cyberterrorism. It won’t be the last..."
John Titus has an interesting look at the maintenance issues created by the increasing use of "smart" electronics in cars. "Automobile repair shops have a beef with auto manufacturers over who can repair vehicles. Many repair shops want to replace "programmable" components but the auto companies won't release the details of how to program these devices for fear of opening their intellectual property to all takers. A story in the 10 February 2011 Wall Street Journal explained that after a mechanic replaced a windshield-wiper switch in a 2004 Saab, the car wouldn't start. The switch needed an "initialization" at a Saab dealer..."
As you're tolerance for something wears thing and anger starts to set in along with heart rate and blood pressure. Throw a PIC and Heart Monitor into the mix, and you've got a basic anger detection module. Rajendra Bhatt explores a method of interfacing with a keypad via a simple 555 timer. The result is a two wire interface for 16 buttons. There are other methods which do not require as many components, such as Jon Chandler's 10 Keys on One Port Pin. Although Rajendra's approach is not often seen and he gets good points for originality! Attached are images of the project, including a schematic of the 555 interface. The 555 timer has been configured as an astable multivibrator. It's output frequency varies based on the active resistance. With R1 and C as fixed components, each key has a resistor which acts as a switchable load (altering the output frequency accordingly). The simplest idea can sometimes be the best..
Bruno Gavand developed a PIC PAL library for displaying information on TV screens. The source code is written in MikroC, and has routines for video control, set pixel, fill screen, draw line/circle/box/character/string amongst others. This project resulted with a simple distance measurement tool which uses an AVR at the core along with and LCD and ultrasonic sensor. Various project images including construction, PCB layout and the schematic.